Over the past two weeks, I have blogged about Online Behavioral Advertising (“OBA”), a practice that allows advertisers to target particular ads to Internet users based on perceived buying interests, and the attendant market for the collected marketing data – huge. There has been some public outcry following the recent decision by Congress to overturn the FCC’s Obama-era regulations to require Internet service providers engaged in the collection of OBA data to permit “opt in” protections for consumers.My impression of the landscape is that this conduct will not escape regulation at the federal level, but that the “who” will regulate and “how” the practices will be regulated are the subject of ongoing debate in a new presidential era of deregulation. 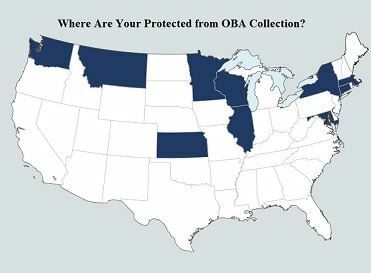 Into the void, enter well-meaning state legislators who believe that they may satisfy constituent concerns by passing state laws that require privacy disclosures, including for the collection of OBA data. State representatives from Connecticut, Illinois, Kansas, Maryland, Massachusetts, Minnesota, Montana, New York, Washington, and Wisconsin have begun legislative efforts to redo what the Trump Congress has tried to undo. Although state regulation may feel good to Mr. and Mrs. Middle America, it creates a nightmare for advertisers, ISPs, and attorneys advising them. Like the greater body of “privacy law”, generally, state-by-state regulation creates uncertainty for business and uncertainty for business stifles growth and innovation and drives up prices. The options for businesses attempting to comply with a state-based patchwork of laws is to either (1) develop and implement technologies that permit the physical location of consumers to be discerned reliably or (2) default to the “highest common denominator” – in other words, comply with the strictest of state laws on a nationwide basis in order to comply while adhering to a uniform business method. The doctrine of federal preemption creates a “floor not a ceiling” for protection under federal law that state law may not undermine. Therefore, if state lawmakers get too far out ahead of the feds on this issue, it will not be as simple to reverse greater protections afforded to consumers in Montana as it would be to impose reasonable protections at the federal level, sooner rather than later, that would render state legislative efforts in his arena less compelling.